I have been re-organizing the Lil Divas playroom. That means getting rid of lots of things that they no longer use or play with at this point. I found this bowling set that rarely gets played with anymore and was struck by inspiration to use it to help the Littlest Diva learn some sight words. She is being very resistant to learning to read. She is my "know it all", "I don't need any help" child. You have one too, right? I know it can't be just me. Please tell me, it isn't just me. She is really making me step up my game, so to speak. In order to get her interest, the activity has to be enticing and fun or she literally walks away from it. 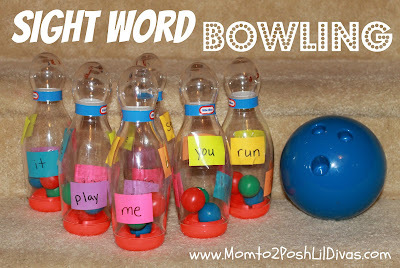 Sight Word Bowling turned out to be a hit! Phew, go me! 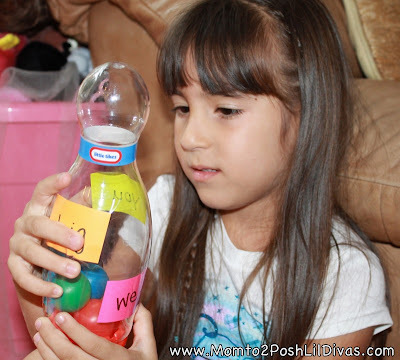 So taking this unused toy and turning it into a learning game had to be simple. But I also wanted to be able to change the words so it could be used over and over again. I opted to use small post it notes that I had on hand and stuck them onto the bowling pins with clear tape. By putting 4 words on each pin, we can practice 24 words at a time. Once those have been mastered I can change the post-it notes and write new words. 1. 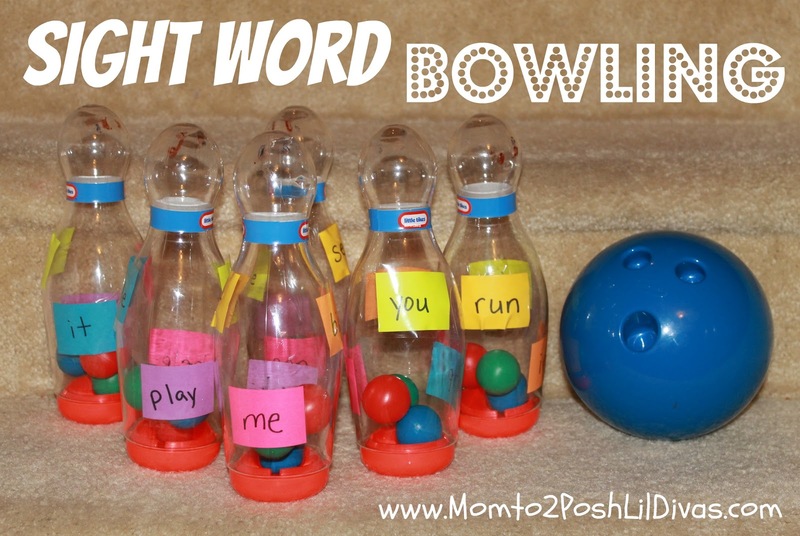 Write target words onto slips of paper or post-it notes and tape onto bowling pins with clear tape. 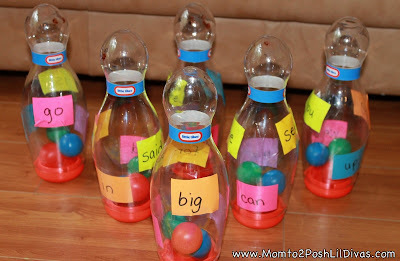 I put 4 words on each pin so that there is always a word visible when the pin falls down. 2. Set up pins as you normally would for bowling. 3. Let child throw bowling ball to knock pins down. 4. Before picking bowling again (or setting up the pins for the next round), the child must read each word that is visible on the pins that were knocked down. 5. Repeat as long as child is interested and wants to play. 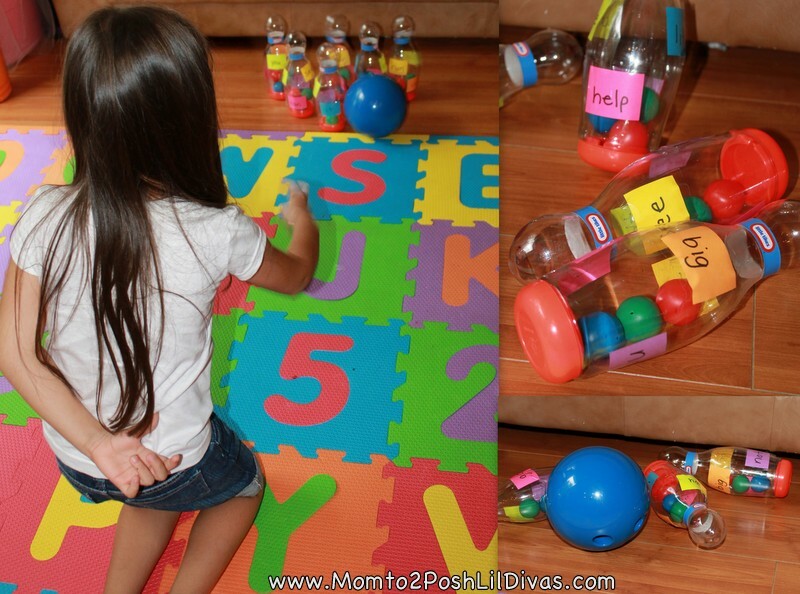 Other ways to play - you can easily adapt this to review letters, letter sounds, math facts and more. I just found your blog and LOVE it. So many great ideas in one place. I'm your newest follower. Welcome Jen! So glad to have you with us. 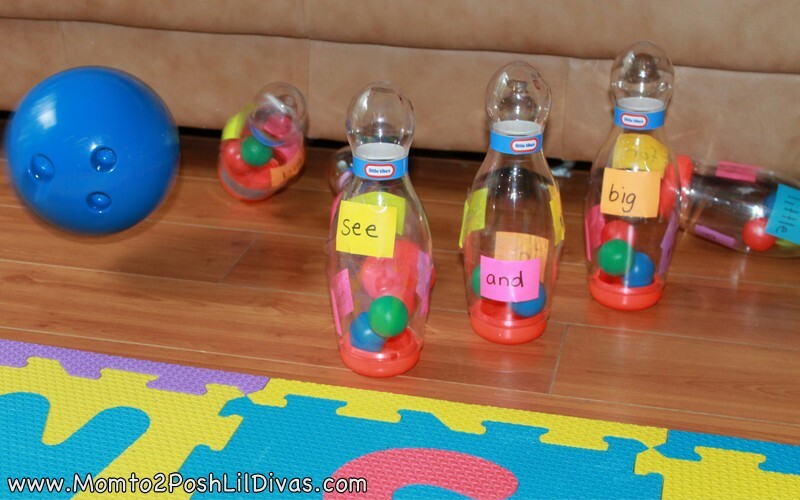 I love this idea for teaching site words. I'm pinning it and sharing it on my blog. Thanks Beth, it was lots of fun. Karlie, I have no doubt the kids will be excited about it too. Where did you get these bowling pins from?